The best part about this recipe is that I am a total wimp when it comes to hot and spicy, but I know so many of my friends love it so I keep trying to find recipes that will push their limits while keeping a safe distance myself! In the late summer my jalapeños have absolutely being thriving! I have more than I could ever manage to eat so for this year's End of Summer Party I thought I would try something new. I did a little research, found some recipes I thought would be good and decided to combine a few of my friends favorites....buffalo sauce and jalapeño peppers! Though there were mixed reviews as to weather the flavor was worth the heat, the entertainment it brought was well worth the price of admission! 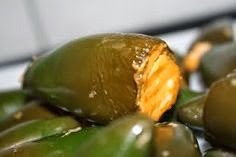 Cut the tops off of the jalapeno peppers and core them using a knife or pepper corer. In a sauce pan, combine cream cheese and Buffalo sauce. Stuff each jalapeno pepper with cream cheese mixture, until full. The amount will vary by the size of the jalapeno. I have found that dumping the cream cheese mixture into a large ziplock bag and clipping one corner of the bag works best to squirt the cream cheese into the peppers (though be warned, this can get kind of messy). Let sit in the fridge for several hours to reset the cream cheese and then bake the jalapeno poppers for 20-30 minutes instead at 375 degrees. If you can manage to get the peppers to stand up straight that is best, whether by using popper stands or aluminum foil. Serve with a side of beer or milk....your friends are going to need it!